We want to help you have the best gourmet experience possible, by providing consumer awareness and education around Specialty Coffee and Tea. That is why we are excited to share with you some of the things we have learned about great-tasting gourmet coffee and tea... Hopefully, you will find this information as interesting as we do! 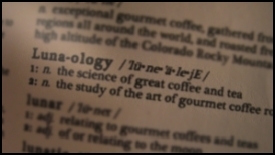 Over the coming months, we will be populating our new Luna·ology Learning Center with a variety of helpful gourmet coffee and tea topics for your enjoyment. So - stay tuned and check back often for new and exciting educational content! - Learn about the legend behind this miracle drink and where it came from. - Get the most out of your Luna Roasters coffee with these helpful tips! - Learn more about the roasting process that makes Luna Roasters' coffee taste so amazing. - Learn how to host a Coffee Cupping event to taste and compare coffees with your friends! - Did you know that tea has been around for thousands of years? - Follow these tips for the best-tasting Tea possible! - Learn the various qualities used to categorize and describe types of tea.